Co-Working Offers Community To Solo Workers No longer do freelancers, entrepreneurs and other independent workers have to face the solitude of working from home. Now, they can enjoy the communal and social atmosphere of shared office spaces. Wi-Fi, laptops and cell phones make it possible to work from just about anywhere these days. They've helped people leave the office and work from the comfort of their living rooms or corner coffee shops. But now, an increasing number of Americans are looking for something in between. Kevin Prentiss started his Internet-based business from his apartment in New York City. For two years, he says he worked 14-hour days in solitude — ironic, considering he runs a social networking site. "I don't know that I was talking to myself," he says. "I think that probably I was talking to myself." For people who dislike the 9-to-5 shift, co-working facilities offer the benefits of an office without the rigid schedule. One of the cons of working from home is often the solitude. Co-working allows people to share ideas across industries as well as create new contacts. Co-working curbs more alluring activities like shopping, watching TV and napping, which are tempting when home alone. Although many people work best in a lively, social environment, others find that water-cooler conversation disrupts their focus. Conversations are sometimes easily overheard and important notes and documents are often left lying around co-working spaces. Discretion-seeking workers are better working from home or a private office. Patrons of co-working facilities must pay rent, usually by the day or month. And depending on the amenities and location, the cost can run upwards of $500 a month. Then one day he heard about New Work City. It's a rented office space in Manhattan where workers like Prentiss can drop in, hook up their laptops and work away with other people similarly mobile, while making face-to-face connections. Membership at New Work City is kind of like going to a gym. The plans range from $150 a month for two visits per week on up to getting your own key. Tony Bacigalupo is New Work City's self-styled mayor. "This is the front door of New Work City," he says. "The first thing you see is a calendar of what's going on." It looks like any other typical start-up office environment: There are two conference rooms, a main room with tables pushed together and a kitchen. Members pitch in for the first aid kit and communal office supplies shelf. There isn't a janitor; everyone cleans up. There are snacks, soda and beer too. "It's real simple," Bacigalupo says. "If you take something, just drop a dollar into the jar." New Work City is part of a trend that started a handful of years ago on the West Coast. Newly mobile tech workers with laptops liked their freedom but still missed the human interaction they got from going to an office. So they formed meet-up groups: casual, once-a-week deals at different locations — sometimes even people's living rooms. Today, Bacigalupo says more and more people are working independently — either by choice, a layoff or both. "The same way that [during] the last century work shifted from blue collar to white collar," Bacigalupo says, "I think we'll be seeing in this century, we're going to be moving away from the idea of a centralized Monday-to-Friday, 9-to-5 workplace, and we'll be moving much more in this direction. People will work when they want where they want." 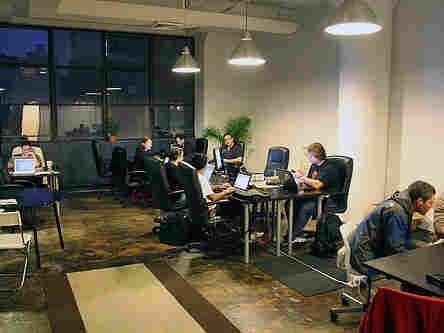 California-based Emergent Research says co-working spaces continued to grow during the recession. Public libraries are also getting in on the trend by offering conferencing and other business services. And co-working is not just happening in major cities. Office furniture giant Steelcase is subsidizing a co-working cottage in East Grand Rapids, Mich. Members there can tap away on their laptops next to a cozy fireplace for $100 a month. Organizers say it's part community resource, part social experiment. Prentiss says he likes the support he gets from other members at New Work City. He's even hired a few people that he's met there. And just like an office environment, there are sometimes silly contests — which he likes. "What it doesn't have, though, because of a lack of the collective [organization] chart, there's not any kind of jockeying or power-play politics," Prentiss says. "So I definitely think it's much of the good and none of the bad. No one is competing here." New Work City is just breaking even, and that's OK with its founders. They say for-profit spaces tend to operate like impersonal office suites and miss what co-working's about — community.